Today Ve.N.I.Ce. Real estate Cera S.r.l. 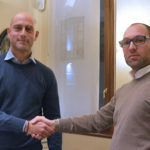 has signed a new collaboration agreement with Dogaressa S.r.l. for the optimization of incoming and real estate services for touristic use located in the historical center of Venice. This agreement will improve the services offered to guests of tourist apartments and will allow to refine the search for an elite customer-target and lover of history and culture, almost less present in all cities of art for the spread of last minute tourism and it will benefit the whole induced of the local business related to tourism. Agreements of this nature demonstrate how the synergistic and constant work among companies known in the urban area is fundamental for the growth of the Venetian economy.